The holidays can be stressful because you have to juggle parties, shopping, cooking, work etc. 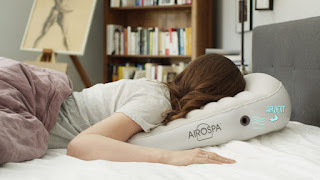 and you also need to take care of yourself so I want to tell you about AIROSPA Pillow it is a face down pillow which us unique and revolutionary created exclusively to rejuvenate your mind, body, and spirit with the ancient art of Aroma Therapy that can also be used for a massage pillow and tanning pillow. It includes a fan that helps the essential oils to circulate. The fan requires 2 AA batteries which are not included. The Benefits is stress relief, a calming effect, reduction of neck and shoulder pain, positioning for improved posture, a reduction or resolution to snoring, a fantastic massage experience, enhanced breathing, Better positioning for those who prefer sleeping or napping face-down, more complete rest and a healthful and relaxing aromatherapy session. My Opinion: This is an interesting pillow which I found easy to inflate and use I do not typically lay face down so trying this for relaxation and aromatherapy I rarely seem to find time to unwind and relax but I need to as I am always tired and feel worn out this was a nice treat and I think I will try and do it weekly. The fan worked well and the essential oils I used were nice with just a few drops. 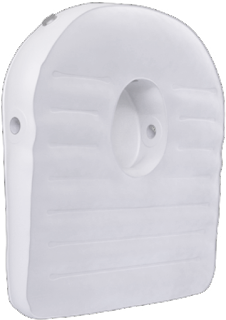 You can clean with a washcloth or disinfecting wipe.